June 27, 2017 — As the world faces a projected population increase from today’s 7.5 billion people to 9 billion people by 2050, the demand for sustainable food sources is on the rise. The answer to this looming dilemma may well reside within the booming field of aquaculture. While wild fisheries have been on the decline for the last 20 years, aquaculture, or fish farming, is the fastest growing food-producing sector in the world and will play an increasingly vital role in our planet’s food resources in the years to come. One of the challenges to aquaculture is that reproduction, as an energy intensive endeavor, makes fish grow more slowly. To solve this problem, Professor Berta Levavi-Sivan at the Hebrew University of Jerusalem identified tiny molecules named Neurokinin B (NKB) and Neurokinin F (NKF) that are secreted by the fish’s brains and play a crucial role in their reproduction. Professor Levavi-Sivan, a specialist in aquaculture at the Hebrew University’s Robert H. Smith Faculty of Agriculture, Food and Environment, then developed molecules that neutralize the effect of NKB and NKF. The molecules inhibited fish reproduction and consequently led to increased growth rates. The technology developed by Professor Levavi-Sivan and her team was licensed by Yissum, the Technology Transfer company of the Hebrew University, to start-up AquiNovo Ltd., established and operating within the framework of The Trendlines Group. AquiNovo is further developing the technology to generate growth enhancers for farmed fish. In recognition of her work, Professor Berta Levavi-Sivan was awarded the Kaye Innovation Award for 2017. Professor Berta Levavi-Sivan earned her B.S. degree in life science and her M.S. and Ph.D. in zoology from Tel Aviv University. At the Hebrew University’s Robert H. Smith Faculty of Agriculture, Food and Environment, where her work focuses on fish reproduction and growth, she has published over 100 articles in referred journals and has won several prizes for her findings. 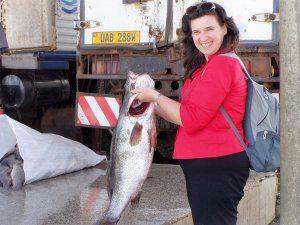 As a specialist in aquaculture, she has worked extensively in Uganda to combat depleted fish supplies in Lake Victoria.